Durable, blow-molded plastic bench features push-button assembly for the arm and back and lets you change the direction of the seat easily without tools. 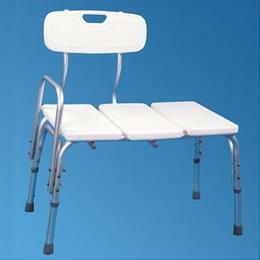 Aluminum frame adjusts in 1 inch increments for a seat height of 16 1/2 " - 21 1/2" above the floor. Suction cup tips on two legs provide additional security. Fits tubs 11" to 21 1/4" deep; 300 weight capacity.